This week, Max is on a mission to stick to his mandate of making New Amsterdam a better place. Iggy is dealing with a tricky case involving a child drowning in pharmaceuticals. Floyd's pride is tested and Helen struggles with the emotional swells of being a doctor. Max doing his best to follow through on the changes he promised and trying to get the hospital staff involved. This includes trying to appeal to a bored board room. One so dead he must resort to a painfully awkward rendition of the "robot" dance to get so much as a peep out of him. However, when he does, it turns out the suggestion isn't half bad. Group therapy: allowing small groups of patients with similar ailments, such as diabetes, the ability to receive treatment together in order to be treated faster and more efficiently. Other changes on the horizon: Iggy wants the candy machines in the pediatric wards removed, more nurses roaming the halls are a must, and a patient advocacy program is in the works to help patients understand their treatment options. All in all, things are looking up for New Amsterdam. The opening scene of this episode mirrors its closing one. They both involve Max hovering over his hospitalized wife to speak with his unborn daughter. If you recall, last episode Georgia wound up in the hospital after she started bleeding and the doctors found baby Luna in distress. Max visits Georgia to speak to their daughter. Luna is clearly going to be an anchor for him amidst all the stress. In spite of all their issues, Max and Georgia still clearly love each other. Unfortunately, Max gets pulled away from her side yet again at the telltale ring of his phone beckoning him back to the hospital - right in the middle of Georgia commenting, "Even when you were there, you weren't," in reference to the issues from their past which have lead them to where they are now. Apparently, things haven’t changed much. Later in the episode, Max feels overwhelmed by the impending visit from the dean of medicine on top of his strained relationship with his wife. He seeks out solace on the roof, only to run into Helen, who is also wrestling with her own demons. Helen addresses the elephant in the room: Max’s cancer. Helen tells him he can’t and shouldn’t handle his cancer on his own, not as a medical director, not as a husband, and not as a patient. He needs to stop trying to handle everything alone and tell Georgia what is going on. I really do love their scenes together. Helen has a knack for telling Max exactly what he needs to hear. It looks like Max is finally going to tell Georgia about his cancer diagnosis, but before he can get in the room he's stopped by her doctor who then warns him not to put her under stress of any kind or it could harm her and the baby. Damn, talk about bad timing. The episode ends with Max seeking the same comfort he found at the beginning. You can’t help but feel for the guy knowing death might be looming overhead while his daughter is on the way. It’s heartbreaking. Iggy's case this week deals with Leo, a young boy who lost his dad a few years ago. He isn't able to sleep and has been wetting the bed. In addition to exhibiting signs of depression and lethargy. Iggy deduces fairly quickly many of Leo’s issues may be stemming from the fact he’s on a heavy amount of psychiatric drugs for someone his age. He doesn’t feel like he can get to the root of Leo's issues until he weans him off the medication. This sounds easy in theory but it ends up being more complicated than when the school psychiatrist who prescribed the pills gets involved. Turns out, Leo’s mother signed a form mandating Leo stay medicated or he will be banned from all New York public schools due to his tendency to lash out violently when not on the drugs. Vijay diagnoses Leo with diabetes, which is causing the bed wetting and likely an effect of the medicine. But getting the contract reversed won’t be so simple. Iggy and Vijay will have to take the school psychiatrist to court and prove the medication is causing more harm than good and Leo's rage was situational not chemical. Conveniently for all involved, New Amsterdam has a built in courtroom! That's certainly one way to move a plot along. Once Iggy is able to get Leo talking, we learn Leo blames himself for his father’s death. Leo cannot deal with his displaced feelings of guilt in any kind of healthy way due to the medication he's been prescribed. With Leo on the stand, he is able to sway the judge in his favor. They discover the reason Leo snapped and became violent with another student was because the student in question told him he should be dead like his father. I probably would have snapped too, Leo. This case highlights many of the issues involving the educational system and its antiquated healthcare. The school psychiatrist was doing her best to maintain the well-being of all her students, as she points out, yes, Leo is important but if he is violent then it is her duty to think of the other children. Iggy argues these kids are over-medicated because it's faster and easier to throw drugs at a problem child rather than taking the time to address underlying issues. The episode doesn't really have enough time to comb through these arguments with as much depth as it could, merely scratching the surface of deeply complex issues but it does raise some provocative questions. A patient with “broken heart syndrome” is brought into Floyd’s care. He's ready to take her into surgery but she's not. Beforehand, she would like her family to perform a religious protection ritual to ensure the operation is successful. Floyd takes this request as a jab at his skills as a surgeon and his pride blinds him to his patients needs. If they don’t trust in his abilities enough to perform the surgery then what does it say about him as a doctor? He gives her a firm no and moves on with preparation. But she crashes each time they start to prep her for the OR. Eventually his desperation makes him grow lenient and he decides to allow the ritual. Afterwards, the preparation goes off without a hitch and he is able to get her on the operating table. Floyd doesn’t suddenly become a believer, of course. He thinks it’s the pacemaker and the other practical medical methods he’s enacted. Lauren points out that before his surgeries, he has his own rituals. We all do. Floyd must scrub each of his fingers ten times, “Why not nine?” Lauren asks reminds him of his inclination to recite a specific passage from Invictus as well. What are these complacencies if not rituals? Routine? No. These are a solemn ceremony performed according to a prescribed order to ensure the best possible results. Floyd reaches an understanding with his patient and becomes a better doctor for it. During the surgery, his patient crashes again and he is determined not to lose her. Even when the other surgeons are ready to declare her dead, Floyd neglects to. He gives her a cardiac massage and is able to bring her back. Sometimes all it takes is a little faith. Helen’s storyline is fairly short and sweet, maybe even a little pointless. I say this because I think Freema is such a stellar actress and I really hope Helen is given more to do soon. Right now she's serving as a crutch to Max and his troubles but I definitely want to see her character flourish and grow in her own storyline. Her patient, Millie, has cancer and is undergoing chemotherapy. Unfortunately the treatment isn’t going as well as everyone had hoped and Helen wants to put her on a different regime. Millie was happy to be under Helen’s wing as she was someone she looked up to. She’s embarrassed she didn't have time to paint her nails. Helen suddenly feels overwhelmed and has to leave the room. Sometimes it is too much. Caring for people who are sick and may leave you at any moment, she gets emotional. Though I was a little confused by this, last episode Helen said she left because she became immune to death and this episode she seems overwhelmed by it? I wonder if something else is going on. Helen eventually pays Millie another visit, this time: with a bottle of pink nail polish. - We learn Vijay has a son. He leaves him a touching voicemail after finishing up on his case with Iggy. We can assume they're estranged based on the context. I'm sure we'll be learning more about this soon. Max: What do you get when you cross an elephant with a rhino? El if I know. My first dad joke. Max: I have fifteen hundred patients, I don’t have time to be one of them. Helen: You better find the time, before you run out of it. Vijay: We shouldn’t have to choose between the physical and mental wellbeing of our children. Max: If Chinatown was K2 then New Amsterdam was Everest, and who can resist climbing Everest? Georgia: Just tell me one thing. One true thing. 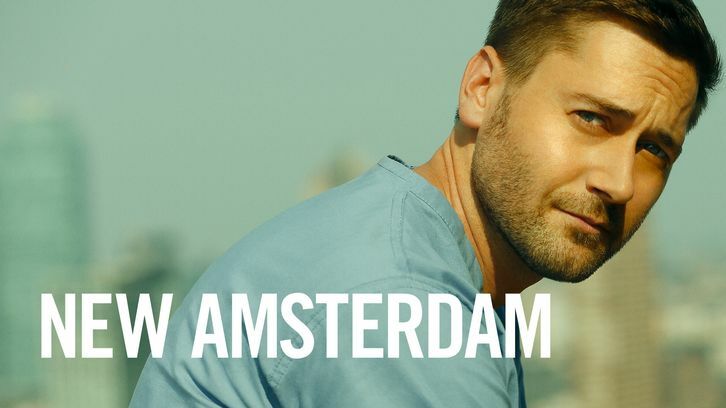 A NEW EPISODE OF NEW AMSTERDAM PREMIERES TUESDAY, OCT. 9 @ 10:00 PM ET/PT ON NBC.